Rock band Metallica have finally made their entire music catalogue available to download from the internet. Fans can buy individual songs from their 10 albums after the band relented on a longstanding refusal to make them available on iTunes and Napster. In 2001, Metallica settled a legal case against Napster - when it was a file- sharing service - for allowing users to download songs without permission. On iTunes the songs are available for download in the US and Canada only. 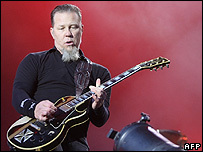 Complete Metallica albums and live concerts have previously been available via other music internet sites and on their own website. But the band had never allowed digital music services to sell single songs until now. A statement on the band's website said: "Over the last year or so, we have seen an ever-growing number of Metallica fans using online sites like iTunes to get their music. "So, in continuing with the tradition of offering our albums for sale online as well as making our live concerts available for download in their entirety we are now offering fans the opportunity to obtain our songs individually." The band have also made available previously unreleased live tracks along with their back catalogue of albums, from their 1983 debut Kill 'Em All to 2004's Some Kind of Monster. Mercury Records, Metallica's record label outside the US, was not immediately available for comment on when the songs would be made available on iTunes outside the US and Canada.